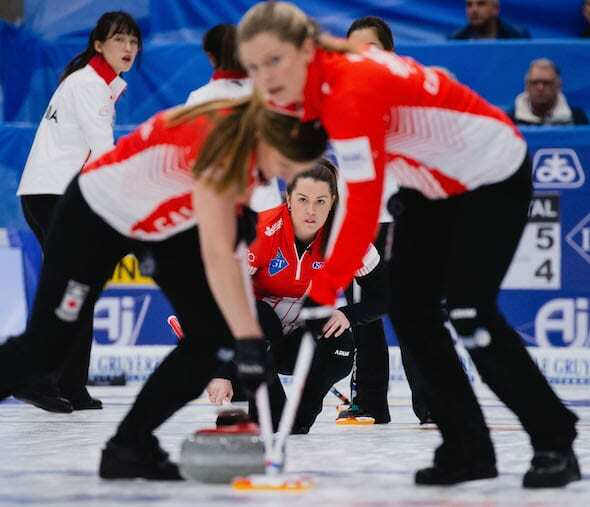 And Chelsea Carey’s Calgary team took a big first step on Wednesday afternoon at the Silkeborg Sportscentre with an 8-7 win over China’s Jie Mei. 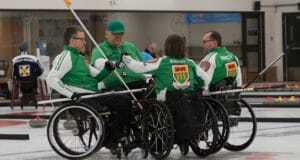 The Chinese entered the game tied for top spot in the 13-team round-robin standings with a 6-1 record while Team Canada — Carey is backed up by vice-skip Sarah Wilkes, second Dana Ferguson, lead Rachel Brown, alternate Jill Officer, team coach Dan Carey and national coach Elaine Dagg-Jackson — was reeling at 3-4 after suffering two disheartening losses on Tuesday. 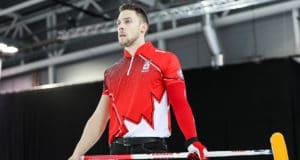 But the Canadians did something they couldn’t accomplish on Tuesday — they made an early lead stand up, and also withstood late pressure from their opponents to finish off a victory. China took its first lead of the game with an eighth-end deuce on a wonderful double-takeout from last-rock thrower Rui Wang, but Canada took advantage of a Wang miss in the ninth to score three and never gave China a legitimate shot at a game-tying two in the 10th. As impressive as the back half of the game was for Canada, it was the way the team responded to adversity that may have been most impressive. In the first end, Carey had an open hit for two on a fresh path of ice. Her stone overcurled dramatically and the team settled for a single; considering the disappointment of Tuesday, that miss could have had a profound effect on the team. Instead, Carey and her teammates simply laughed it off. China tied the game with one in the second, and the teams traded deuces the next two ends, and it was a back-and-forth battle the rest of the way before Canada nailed down the victory. Canada is back in action twice on Thursday — at 4 a.m. (all times Eastern) against Switzerland’s Alina Silvana Tirinzoni (4-3) and at 9 a.m. against Russia’s Alina Kovaleva (6-2). The top six teams after round-robin play concludes on Friday will make the playoffs.